This could be a wonderful cake topper, wedding favor or even a wedding gift. 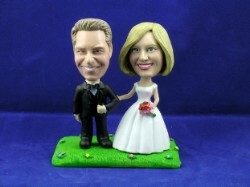 Wedding Couple holding hands custom bobblehead is the sight to behold. Our bobble heads turned out fabulous and everybody was absolutely wowed and amazed at how much they looked like us.